In the industry today, we maintain a barrier--a fenced off barrier--between human work and machine work. But the industrial value creation of tomorrow is to be found in the fusion, in the interplay, between humans and robots. Will robots make us all unemployed? No, because we do not have, nor will we ever have, machines and technology that can take over all jobs. However, if you hold a monotonous and repetitive job you will have to come to terms with the fact that your tasks or work place might change as robots become more flexible and intuitive to work with. It is just as well! It is not reasonable to use people as if they were machines. It is not healthy for neither body nor mind to perform the same backbreaking movements feeding raw pieces for processing into a machine all day long. Introducing robot technology is of course not just about relieving people from mechanical wear-down. It’s about using also both resources and machines optimally enabling a production process to run without interruptions. The human aspect has been lost somewhere in this development where the fenced-off robot technology dominates the factory floor. Actually, far from dictating only machines IN PLACE OF humans, the development and the technology is headed towards man AND machine, and they will work in closer and closer collaboration. In the industry and society of tomorrow, we will be using robots for the tedious and predictable and people for handling the unpredictable, adding soul to the products--such as customized goods of extra high quality where greater attention is paid to detail. In actuality, modern robots will give the industrial workers more influence in production.Valuable knowledge is built on the factory floor, and robots can neither collect nor acquire experience from it. Only people can do that - creative people that problem-solve and improve products. A skilled cabinetmaker might see a piece of wood and say, 'this piece of wood would make a really fine table.' A robot cannot do that. As of now, a big gap has materialized in the value-creation process after the first four industrial revolutions: Mechanization, electrification, automation, and now digitalization. It is this loss of value that the fifth industrial revolution should remedy. The values in the world have been created through industrial production but the production environment has scared creative people away from the manufacturing industry. 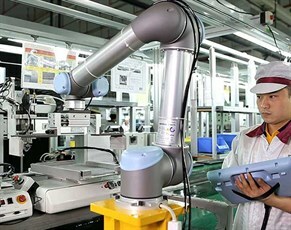 Now the new generation of collaborative robots enables us to view robots in a new way. 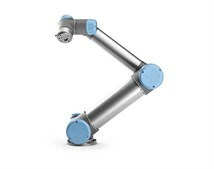 At the electronics manufacturer Wistron, they have embraced the opportunities in the new collaborative robot types, also called cobots, whole-heartedly. At Wistron robots and people work side-by-side interacting with one another, resulting in increased productivity, improved staff retention and, reduced training costs and overall a much improved competitive edge. The same happens on the BMW assembly line. The big breakthrough is the modern robot’s 'senses' in the form of sensors, cameras, and other safety features. Human intelligence works in tandem with robots, it’s a quantum leap from the conventional and potentially dangerous industrial robots. Universal Robots creates cobots, and cobots are realizing - to put it bluntly - the fifth industrial revolution. 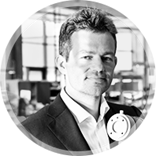 People can use cobots to build passion and soul into their products. Right in the factory where products are made. Consumers are increasingly willing to pay a high price for specialized products because they want to feel special. An added bonus is that the manufacturer can increase the profit margin even though it costs extra to build more soul into these products. So let’s get the robots out of the cages. The creative people into the manufacturing industry. And the soul back into the products. At Universal Robots we're always looking for the talented, passionate people that will help us do just that. Check out our opportunities here. Esben H. Østergaard, Director de Tecnología de Universal Robots, es responsable de la mejora de los robots UR existentes y del desarrollo de nuevos productos y uno de los creadores del producto. Desde 2001 a 2005 trabajó investigador y profesor asistente en robótica en la Universidad del Sur de Dinamarca, donde creó la base para la reinvención del robot industrial, que le llevó, ese mismo año, a fundar Universal Robots junto con dos de sus colegas de investigación. Desde entonces, Universal Robots ha obtenido alrededor de 65 patentes de la tecnología del robot. Además de su trabajo como CTO, Esben H. Østergaard participa en proyectos nacionales de investigación y en varias universidades en Dinamarca. En los inicios de su carrera, trabajó como científico investigador en USC Robotics Labs en el sur de California y también en AIST, en Tokio, como investigador visitante. Durante sus estudios en Informática, Física y Multimedia en la Universidad de Aarhus en Dinamarca, se centró exclusivamente en robótica y se convirtió en campeón mundial de fútbol robótico en 1998.